In a community where poverty is kept close and passed from one generation to the next, two teenage boys, best friends Ashvin and James, stand on top of twin tower blocks. Facing each other across the abyss of London's urban sprawl, they say their goodbyes in the final stages of a suicide pact. The boys jump together, each with a rope around his neck. Only Ashvin dies. James awakes in hospital, struggling with guilt and faced with his dysfunctional family, a well-meaning psychologist and, eventually, Ashvin's grieving sister Armeina. 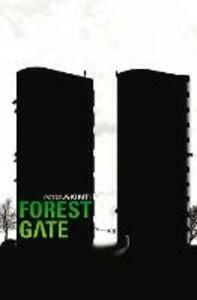 Forest Gate is narrated by Armeina, a young refugee from Somalia who, with the death of her brother, suffers the loss of her entire family. As she tells the story of her brother's life and seeks to understand why he would kill himself, she finds herself drawn to James. Seeking comfort from each other, and desperate to rebuild their lives, James and Armeina form a special bond and together set out to find a place they can both call home. Set in London, Somalia and Brazil, Peter Akinti's debut is a beautifully wrought, profoundly affecting and sometimes violent novel rich in the true history of our time. Armeina and James's journey towards life through their past is, ultimately, a powerful story of redemptive love.